John Amber shooting his 25 pound H.C. Leman Civil War sniper’s rifle. Caliber is .45, and the equipment includes false muzzle, telescope sight, and an assortment of tools. Sure, a lot of the guns you read about are costly pieces, but in general those guns that took a deep bite out of the proud owner’s poke are the fancy, engraved, as new or mint condition arms of great rarity. That’s why they were written about in the first place. You, as a beginning gun collector, however, can spend as little as you please — and if you will take these well-intended words to heart, you will spend your hard-earned shekels slowly and cagily. A large number of budding gun collectors, both young and old, once they’ve been bitten by the gun bug, have thrown their money about with wild abandon, buying this, that and the other gun with little or no real conception of the value — if any — of the old iron they were latching onto. Let me add right now that I’m not condemning “old iron” here as such — it has its proper place. Those rough conditioned, battered or broken guns, frequently lacking major or minor parts, are usually what the youngster starts with when the collecting virus strikes. If the novice collector, youngster or not, buys them “right,” meaning a nominal price of from 50c to a few dollars, he can profit from a study of them. Tearing them down, putting them back together — the latter is much the harder job, usually — perhaps repairing them or cleaning them up, can give the interested arms student valuable information and knowledge, knowledge that will be helpful when the first flush of enthusiastic indiscrimination has given way to more informed and careful selection of the particular branch of arms that his interest has fixed on. I said gun collecting was easy, and it is. Not as easy as stamp collecting, perhaps (and I don’t want to hear from a bunch of irate stamp collectors, either), but quite simple and painless really, provided. Let’s reverse our field briefly, and I’ll outline the case history of the average beginning gun collector as I have observed him over 25 years, and it includes your correspondent at an early, uncritical age! Sauer & Son single barreled rifle, circa 1885, with the gold nameplate of the Duke Ernst II of Saxe Coburg (Germany). Weight is only 6 lbs., yet the cartridge used is the Black Powder Express 500-3, loaded with 136 grains of powder and a 380 grain bullet. This gives about double the free recoil in foot pounds of a 180 grain load in an 8 Ib. 30-06 the Duke must have been rugged! We see the young collector — and sometimes not so young — flushed and feverish. He has been infected with the dread disease, and his native caution has gone by the board. His money burning a hole in his pocket, he haunts the few gun shops or antique shops within his ken, buying whatever fits his pocket-book, whatever may be offered, and — often enough —whatever the dealer may be stuck with! Almost invariably he has no idea of prevailing values, no background knowledge of arms and their relative scarcity and/or desirability. He doesn’t know anything of the current or potential trends in gun collecting, he is uncritical as to arms condition – a most important point in setting value — and, all too frequently, he couldn’t care less! But he’s going to have that double-action Hopkins & Allen revolver with the broken hammer, the busted grips and the rusted barrel or else — and he usually buys it, too, at about five times what it’s worth. The disease now runs its hectic course until one morning our hero wakes up and it’s over. He finds himself with a bushel basketful of assorted rusty objects — these are guns? — a few battered muskets, and a headache. He is now a sadder and wiser man — well, sadder, anyway — and he does one of two things. He calls in the nearest junkman and unloads the iron, resolving to take up golf, and to hell with gun collecting. Or, fortunately for the game, he takes stock of himself and his lack of essential firearms knowledge, and decides to go at this gun collecting game sensibly. Now — and I want to make this as strong as I can — none of this had to happen, and it needn’t happen to you. Before you make a single purchase you should do all of the following things, letting a good 30 to 90 days elapse before spending a dollar on guns! 1. Write to all of the antique arms dealers listed in the Directory of the Arms Trade (elsewhere in THE GUN DIGEST), and ask for their catalogs or lists. Compare the prices of the arms that interest you, and try to reach an average price. Remember, however, that rarely are two guns of the same make and model in exactly the same condition, an all-important factor in determining price. Collecting firearms is enjoyable and rewarding if you go about it right — but not many do. Here’s a step-by-step approach that will save you time, temper and money — if you heed it! 2. Get a current copy of Chapel’s Gun Collectors Handbook of Values, and read it. Do not fail to read the opening chapters, wherein the author describes his system of evaluating arms, his terminology for degrees of condition, etc. This valuable work was last issued (3d ed., revised) in 1955, hence the prices shown cannot be depended on entirely, but the relative values are still very much worthwhile. 3. In addition to the list of antique arms dealers listed in THE GUN DIGEST, there is an extensive selection of books for the gun collector in the Gun Book Review section, and a list of nearly 30 Arms Associations scattered over the United States. Join the local association or associations, and attend their meetings, usually held once every 30 or 60 days. Study the arms exhibited, check prices against condition on a comparative basis, talk to the members, but — huh unh — don’t buy yet! One of the most valuable organizations listed is the National Rifle Assn. You will be doing yourself and the firearms field in general a good turn by joining this oldest of the arms associations, for almost alone it has fought and withstood the annual avalanche of federal and state anti-gun laws proposed. 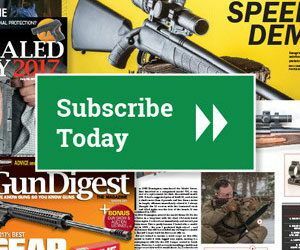 Your membership will bring you The American Rifleman 12 times a year, a periodical with excellent reading for everyone interested in firearms, shooting and hunting. As a gun collector, read the classified ads as part of your training program, again checking comparative prices, and write to any antique arms dealers not found in THE GUN DIGEST. Subscribe to the Shotgun News, published at Columbus, Neb. A sample copy will be sent on request. The title of this monthly publication is something of a misnomer, in that the paper is full of gun ads of all kinds. Two rifles by the same fine maker, Carl Stiegele of Munich (Germany). The top view shows a “parlor” rifle of 6mm caliber, an unusual breechloader that probably used a “loaded ball” like the Volcanics did. There is no extractor. The deeply textured Damascus barrel is covered with silver inlay in relief. The lower rifle is a Martini-actioned target type in 8.15 x 46.5mm caliber. The action and barrel are gold and silver inlayed, and engraved. The writer is not fond of carved gun stocks usually, but the carving seen here is first class. 4. If you have honestly followed the above steps, you are now ready to buy guns intelligently, critically, and with proper regard for their real value. And if you are really interested in old guns, the job should have been a pleasure, not a chore. I well remember the joy with which I tore open a just-received gun catalog, the avid poring over it I did, pricing this, selecting that, writing letters, asking questions. 5. In the give and take of buying a gun or trading for one through a local dealer, where you can handle and examine his wares, you buy on a “for keeps” basis usually, unless there is an express agreement to the contrary. This is only fair to the dealer, for you have had the opportunity to look the gun over carefully. It is a little too much to ask the dealer for a refund after a few days or a week, because he might have had a chance to definitely sell it during the time you had it. Buying by mail, however, is something quite different. In the beginning, until you get to know your dealer or dealers — and they get to know you — DO NOT SEND ANY MONEY! Stay on top of what’s happening in the ever-changing world of firearms. Virtually all of the reputable dealers are quite willing to send you a gun on approval without payment if they know you, the gun to be returned to them within a few days usually, if unsatisfactory. Or via express collect with examination privileges. This system permits you to examine the arm in the express office, either accepting or rejecting it as you see fit. If you have received a gun on approval, be sure you do not abuse the dealer’s confidence — see that the gun is returned to him within his time limit, and in the condition in which it reached you. Lest it seem odd that I should stress this, let me assure you that many arms have been returned to dealers with parts damaged from the gun having been taken apart, or shot, or “repaired,” etc. It may have struck you, from a few things I’ve said earlier, that the field of gun collecting is rife with crooked dealers. Nothing could be farther from the truth in fact, for by and large the average dealer — and I mean 98% of them — is scrupulous and fair to a high degree. As you get to know them, you will find them leaning over like the Tower of Pisa to give you a fair shake. Most of my best friends in the gun collecting field are dealers, and I’ve known many of them for years. Don’t forget that honest, square dealing usually begets more of the same. But let’s not kid ourselves completely — there are some bad apples in this game, some cheaters and fakers who have taken the unwary to the cleaners. But please note that I said “unwary” customers. If you will observe religiously my warning about not sending money to people you don’t know or who cannot be vouched for otherwise, you will never lose any money on a parcel post or railway express transaction. Gun collecting is educational. Yes, it is easily that. If your interest develops in martial and frontier arms, you will soon learn a great deal more about many phases of our history. The “Kentucky” long rifles of the 18th century and their deadly effect in the War of Independence; the Brown Bess and other smoothbore muskets used by a far greater number on both sides of the same conflict; the numerous types of arms used in the Mexican War, the Civil War, the Spanish-American War, and World Wars I and II. The weapons of the old frontier have a great fascination for many: the Colts and Remingtons, the heavy Hawken rifles of the mountain men; the muzzleloading trade guns and rifles of the Indians; the Henrys, the Winchesters and the Springfields of the plainsmen and cattle herders, of the settlers and the miners; the derringers of the gamblers and the famed Sharps rifles of the equally famous buffalo hunters. All of the lure and romance of the Old West curls from the mouths of their long silent barrels. Top – Long Range type rifle by H. F. Clark, patented in 1885. The breechblock, hammer, trigger and guard rotate together around the hinge pin seen at the forward, lower edge of the action. All metal parts handsomely scroll engraved, this first quality rifle may be unique. Bottom – Gibbs-Farquharson rifle. The steel plates covering the forward portion of the stock are called Selous sideplates – Frederick Courtenay Selous, famous African hunter of the late 19th century, gave his name to this stock-strengthening device. He wrapped a broken stock in the field with wet, green hide. This dried very hard and taut, making a strong repair. Perhaps your interest lies elsewhere. If so, there are many fields to choose from. Oddities in arms may take your fancy, queer and grotesque types and mechanisms that had a short life; complicated and elaborate designs that look like anything but firearms. Palm pistols, chain and other multi-shot arms, dagger and brass-knuckle combination revolvers, harmonica and turret revolvers and pistols, and hundreds of others. Guns of the old world may attract you. The magnificent craftsmanship, the details and painstaking artistry of the Italian masters of the 16th and 17th centuries; a beautifully chiseled wheellock or snaphaunce by one of the Comin-azzi of Brescia. Or a handsomely boneor ivory-inlaid German pistol or long gun; the truly splendid works of art by France’s great gunmaker, Boutet; the highly engraved and elaborate arms from Austria, Spain, France, Belgium, Holland and Bohemia, with the fine flintlock duelling pistols of England making no such brave show, but worthy of note for their perfect, precise workmanship. One of the finest collections in the world of this type is in the Metropolitan Museum of Art, 84th Street and 5th Avenue, New York, N. Y. Another fine collection of European arms is to be seen in the Harding Museum, 4853 Lake Park Avenue, Chicago, 111. The tracing down of firearms design through the centuries may be the thing for you. While the list of the basic types is short — handcannon, matchlock, wheellock, snaphaunce, flintlock, caplock and metallic cartridge — the ramifications and side departures from the parent models are extremely interesting, and far too numerous for anyone to hope to gather them all. As an example, between the flintlock and the caplock as we know it today, there were upward of 25 different ignition forms offered, patented and made for sale. Some of these — the rare Forsythe scent-bottle and sliding-lock detonators, for instance — are exceedingly interesting and quite valuable. Colt arms of the percussion period interest more collectors, doubtless, than any other single make — and that will stand as the greatest understatement of the year, probably. Prices for Colt arms have risen tremendously since the end of World War II, far surpassing most other makes or types in their percentage increase. You, the beginning collector, would do well to choose some other field, and unless you are well-heeled you are going to have to keep away from them. But don’t let that discourage you at all. There are many relatively untouched branches or fields in gun collecting. You have read enough now, you have familiarized yourself with prices and the directions that collecting is taking. Pick out something that is not getting a lot of attention, make a new trend for yourself, look over the vast field of firearms — and related items — and make your own choice. Take a good look at long arms, rifles and shotguns. Few people collect these today because of the much greater difficulty of finding space for 50 rifles, say, compared to the same number of handguns. But if space is no problem for you, there’s your opportunity. I’ll give you an illustration of what can be done in the enhancement of rifle values. A few short years ago, the now famous “One of One Thousand” Model 1873 and 1876 Winchester rifles were known to only a bare handful of collectors, and they had no special value, $75 to $100 being about all that one would bring. Bill Depperman, then publicity director for Olin Industries, the parent organization for Winchester-Western, floated the story (essentially a publicity release) of these scarce rifles. A tie-in followed with the motion picture “Winchester 73,” and the scramble was on! Now these Model 73s with the magic inscription “One of One Thousand” or”1 of 1,000″ on the barrels are well-nigh worth their weight in gold. Top – This 19-lb. percussion rifle, shown with false muzzle removed, is signed J. Harding, Lowell, Mass. Cast Steel on the barrel. Nothing is known of this maker so far, yet this is too well made to have been an amateur’s effort. The 32 1/2″ octagon and 16-sided barrel is 50 caliber. All furniture except fore-end tip is German silver. This 20-lb. rifle carries an oval gold medallion inscribed Presented by the Helvetia Rifle Club of N.Y. to the Third Union Shooting Festival, New York, July 1868. At that time it was probably 45 caliber or larger, yet the barrel is signed George C. Schoyen, Denver, Colo., and the caliber is now 32. The mould and other tools are typically 32-40 cartridge style. The name on the lockplate is E. Phillips, N.Y., presumably the original maker. Emil Berger is engraved on the buttplate, possibly the man who won this rifle in 1868. My own collection, some 300-350 arms, is primarily a rifle collection, though about 75 handguns are contained in the total. With that many long arms, you can readily believe that I know something about the space needed to store and display them! Most of these rifles are of American make, running from the flintlock “Kentucky” and early U. S. martial rifles through light to heavy percussion rifles of both hunting and target types, and on to early metallic cartridge rifles — the Sharps, Ballards, Winchesters, Peabody-Martinis, Stevens, and many others of single-shot form as well as numerous lever-action repeaters. The bulk of these latter rifles are engraved and fancy specimens of the sporting and target models. Perhaps the most interesting rifle in my collection is a Sharps Model 1874 sidehammer, custom made by Frank W. Freund for Pierre Lorillard II, the founder of Tuxedo Park and a noted hunter-rifleman of his day, the 1870s and 80s. Freund was a German immigrant who worked at Cheyenne, Wyoming, and elsewhere in the West, becoming famous as a frontier gunsmith. A prolific inventor, he was granted nearly 30 patents in the space of a dozen years, and the Lorillard rifle contains several of his patented features as well as his skillful engraving and the motto “American Frontier” incised on the frame. My most recent acquisition is a magnificent rifle in nearly new condition by the most famous of English gunmakers, Joe Manton of London. This is a tube-lock rifle of 54 caliber, made about 1822, complete in its mahogany case with all accessories; powder flask, bullet mould, greased linen patches, cleaning implements, etc., etc. The tube-lock is an interesting form of ignition, occurring between the flintlock and the thimble-like percussion cap, and Manton was granted a British Patent on this form in 1818. The tube itself is a thin copper cylinder, about one-tenth inch in diameter and three-fourths of an inch long, filled with a detonating compound. Closed at one end, the open end is held into the touch-hole or flash-hole of the barrel by the clamp-like jaws of the lock work. On pulling the trigger, the hammer nose crushes the tube, and the flame of the ignited mixture fires the main charge of black powder. Many gun collectors find their greatest enjoyment in the chase — the actual acquirement of the long-sought gun is frequently something of an anti-climax. This is not surprising — comes the first rumors of the existence of an arm rare and long desired; the efforts now to locate it, the additional efforts to prevent it falling into the hands of a rival collector, the correspondence entailed in inducing the often reluctant owner to sell or trade it, the final reaching (not unusually through good old fashioned haggling) of a mutually agreeable price. All of these things carry varying degrees of uncertainty, so that the ultimate possession of the gun itself is, to a degree, a letdown. We’ve all been through it scores of times, but our interest and enthusiasm continues unabated, and so will it be with you. Mr. Herman P. Dean, of Huntington, W. Va. was, until recently, the owner of what was probably the finest collection of early American arms in the world. Not long ago he gave most of them away — a good part of his collection went to the Huntington Museum, others went to his many friends, and he kept a few that he couldn’t bring himself to part with. Mr. Dean says that he is through collecting, but I have an idea that he will start again, full of renewed enthusiasm, to acquire a new gun collection. But the best part of gun collecting, I think, is the relaxation it offers, the chance to meet and make friends of so many fine people. Many enjoyable and profitable hours can be spent at the numerous gun collectors meetings; in visits to other collectors, to museums and various gun displays; time can be well spent in reading and studying the lore and background of firearms. Many gun collectors — and other collectors too, of course — today find their hobby a welcome distraction from the pressure of modern living, a means of taking themselves out of the day to day monotony of their bread and butter jobs. Gun collecting is an avocation for leisure hours, and the pursuit of it invites repose, contemplation and — at least temporarily — a release from worry and care. John T. Amber was the Editor of the Gun Digest annual book from the 1951 through 1979 editions, and served as Editor Emeritus from the 1980 through 1986 editions.